The curves resulting from the above analysis are shown in fig. 1-35. 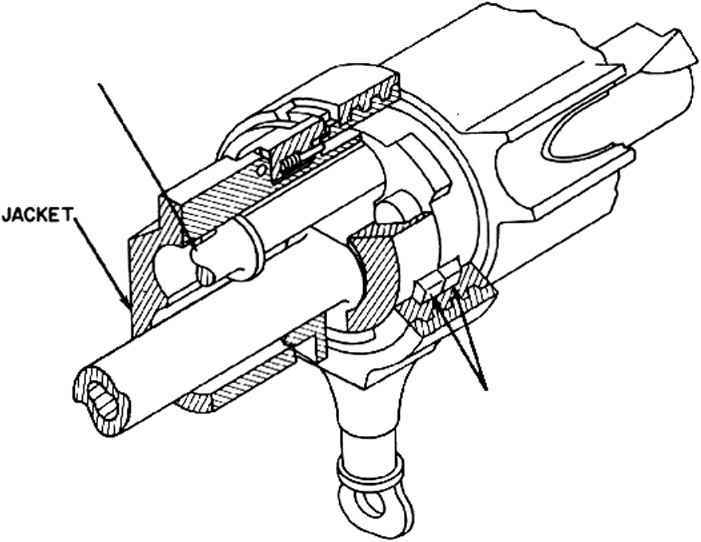 As shown in the figure, the barrel reaches the battery position with a velocity of 12.0 feet per second at 0.01S)8 second after the ignition of the propellant. The barrel is brought to rest by a buffer and remains in this position until the bolt returns and a new evele is started. used for analyzing the bolt movement after unlocking are generally the same as those used for plain blowback and employ the momentum relation expressed by the curve shown in fig. 1-13. In this case, the applicable portion of the curve is the part after 0.00334 second, at which time unlocking occurs. This portion of the curve is reproduced in fig. 1-36. The values of bolt momentum read above the horizontal line which crosses the curve at 0.00334 second represent the after unlocking. Dividing these values by the mass of the 10-pound bolt for the gun of the example gives the additional velocity imparted by blowback. Fig. 1-37 shows the complete curve of velocity for the bolt. (Up to 0.00334 second, the curve shows the retarded velocity curve from fig. 1 -34 as obtained for both the barrel and bolt. After 0.00334 second, the curve shows the additional free velocity imparted by blowback.) The theoretical curves of bolt travel and bolt velocity versus time are then obtained by the same methods used for plain blowback.